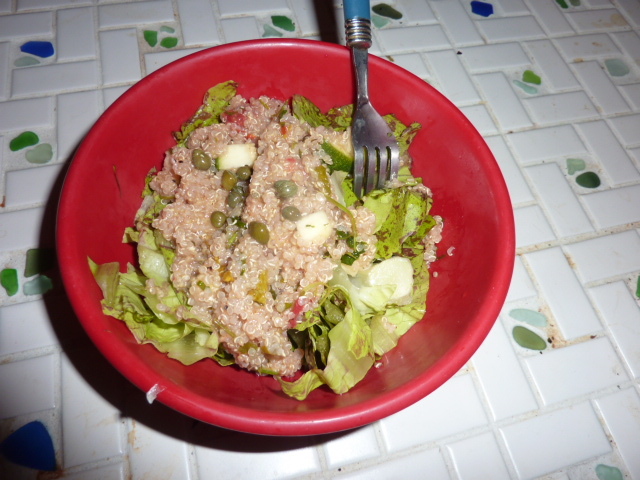 This quinoa salad was light, fresh, healthy, and extremely yummy. Though it could easily be served warm or room temperature, I thought it was really great cold. The greens we served this over were ever-so-slightly bitter, which worked really well with the slight nuttiness of the quinoa and bite of the red wine vinegar. The brine-y bite of the capers really tied everything together and knocked this salad out of the park. This was even better today for lunch than it was last night thanks to the fact that all of the flavors had the evening all alone in the refrigerator to get acquainted. On another note, Zak and I are going out of town for the weekend of the Fourth. I will not be posting our usual CSA post on Saturday; rather, I will wait until we return to collect (the remnants of) it from whichever set of parents is gracious enough to go pick it up when we return on Sunday evening. I will hopefully be back on schedule posting recipes by Monday evening. Bring homemade chicken stock to a simmer over medium heat. Add quinoa and cook, covered, 12-15 minutes until grains are tender and cooked through and liquid has been absorbed. Meanwhile, whisk together olive oil, red wine vinegar, ground mustard, and kosher salt and freshly cracked black pepper. Combine all ingredients except lettuce. Transfer to refrigerator and let cool to desired temperature. Serve atop chopped lettuce garnished with capers. It’s official – garlic scape pesto is delicious. It has a delicious garlic and onion aroma and flavor without the bitter punch of raw garlic. Tossed simply with some olive oil sautéed zucchini, this was a healthy and delicious meal. I really loved how the natural sweetness of the zucchini and unique, aromatic flavor of the garlic scapes shone through in this dish. This pesto is also great on bread as a snack or spread on a grilled cheese, so the recipe makes more than you will need for two servings of pasta. For lunch yesterday, I smeared a tablespoon or so on two slices of bread and popped them in the toaster oven with a few thin slices of smoked gouda cheese until the cheese was just beginning to brown and melt, added some lettuce, and formed a sandwhich. It was absolutely delicious. Heat olive oil over medium-low heat in a medium sauté pan. Add zucchini and reserved ends of garlic scapes from below and season with salt and pepper. Sauté over medium-low heat for 10-15 minutse until zucchini and scapes are very tender. Add cooked pasta and 3-4 tbs. of pesto from below. Toss and stir to combine and coat. Add garlic scapes, lettuce, and walnuts to a food processor. Pulse 15-20 times until well combined. Add cheese and pulse another 10-15 times until only small chunks remain. Season with kosher salt and freshly cracked black pepper. With food processor running, slowly add olive oil until a mostly smooth paste is formed. If necessary, add more olive oil or scrape down the sides of your machine. Toss 3-4 tbs. 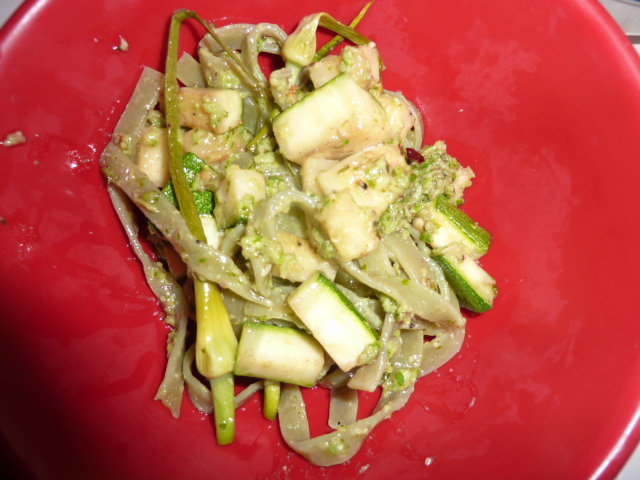 with pasta and zucchini from above. This dish is the epitome of simple, healthy, and delicious. The fresh vegetables from our CSA and excellent quality salmon were elevated with a simple marinade of olive oil, garlic, red wine vinegar, and dill. The salmon was perfectly cooked – just barely warm in the center and flaky and delicious on the outside. 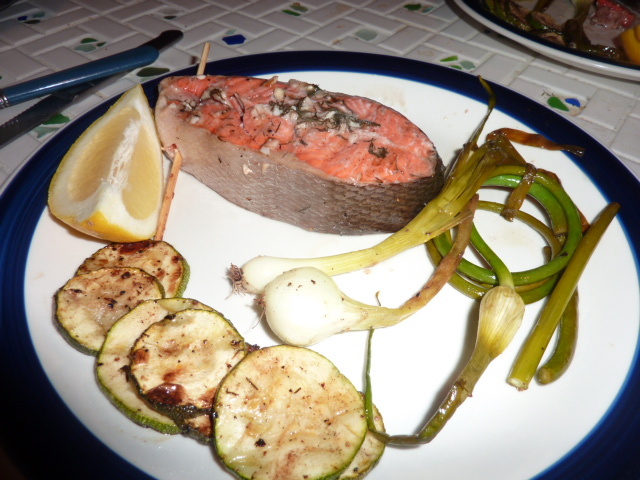 The dill flavor was subtle but highlighted the freshness of the fish. The vegetables were tender and mouth-wateringly flavorful, with a hint of acid from the red wine vinegar and a natural sweetness. 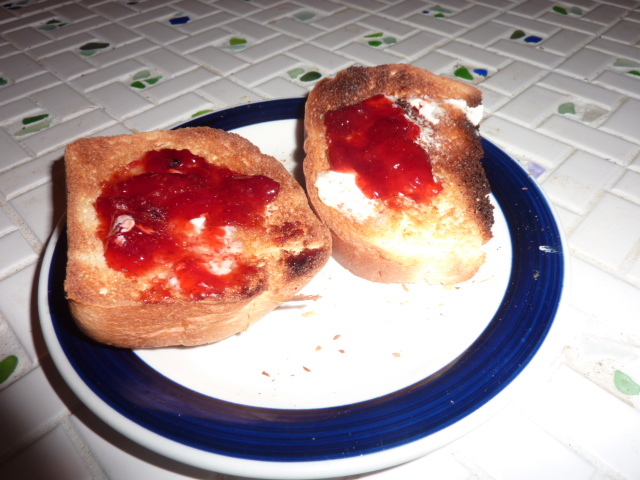 We both immensely enjoyed this due to the variety of flavor and texture. Mix together marinade ingredients. Add fish and let marinate 2-4 hours. Preheat grill. Spray grill grate with non-stick cooking spray. Once vegetables are nearly cooked through (see below), add sockeye salmon to the grill. Cook 6-7 minutes per side until cooked to desired consistency and temperature. Serve with grilled vegetables and a lemon wedge. Mix together olive oil, red wine vinegar, kosher salt, and freshly cracked black pepper. Toss all vegetables in oil and vinegar combination to coat. Reserve oil and vinegar combination. Lay out a flat square of tinfoil on your grill. Add garlic scapes. Cook, turning and brushing with oil and vinegar mixture frequently, about 15-20 minutes, until tender and cooked through. Meanwhile, place green onions on a flat square of tinfoil. Add a tbs. or so of oil and vinegar mixture and form a pouch. Place on the grill and cook 15-20 minutes, turning a few times, until tender and cooked through. Serve directly off the grill. It finally, finally cooled off for a couple of days, so I was craving something warm and comforting. 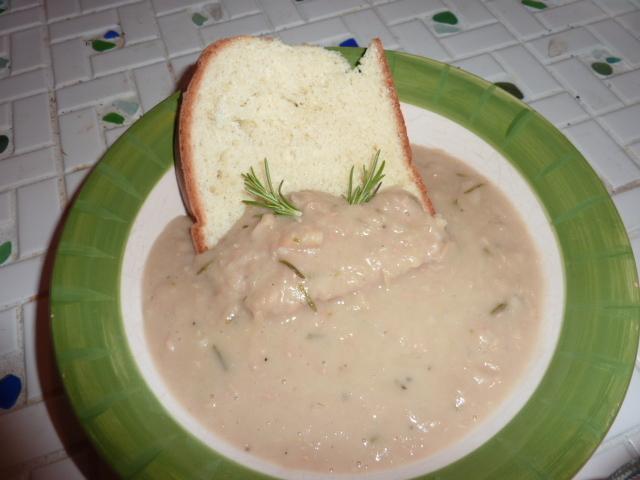 This cannellini bean based stew and some fresh homemade bread was the perfect solution. It is amazing how flavorful and delicious this stew is considering the limited number of ingredients and fairly short cooking time. The earthy flavor of the rosemary and creamy flavor of the cannellini beans combines into something that is greater than the sum of its parts. I really wish I had doubled the recipe, because it was addictive. I simply could not get enough of this stew. Heat olive oil in a medium, heavy-bottom stock pot over medium heat. Add onion and cook until translucent. Add garlic, rosemary, and splash of red wine vinegar. Add chicken stock and cannellini beans and simmer 15-20 minutes. Pick out rosemary stems. Transfer to food processor and pulse 5-10 times until mostly smooth.